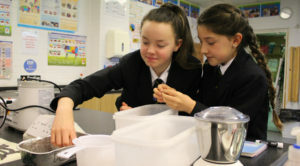 Last year we took part in a Fairtrade competition with our sponsors the Co-op. 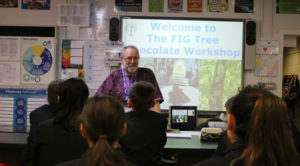 Our prize was a full day chocolate making workshop with The FIG Tree. The FIG Tree is a social enterprise based in Garstang, which happens to be the first town to become a ‘Fairtrade town’ in 2001. 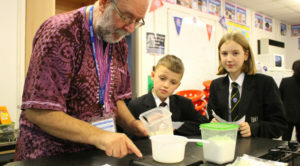 It provides specialised fair trade talks and workshops telling the now famous ‘Garstang story’. 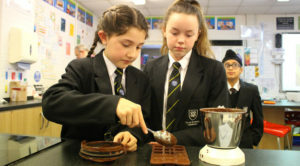 Their work with sustainable farming in New Koforidua, Ghana – the first Fair Trade Town in Africa, inspired them to start making their own chocolate using beans in purchased directly from the farmers there. Bruce brought some of those beans to us so we could make our own delicious and fairly traded chocolate. 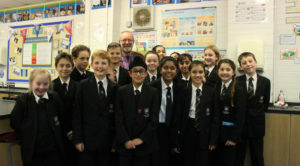 Year 7s with the most merits and best attendance got to take part. 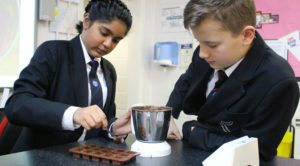 First the students prepared the cocoa beans for roasting, sorting them into trays. 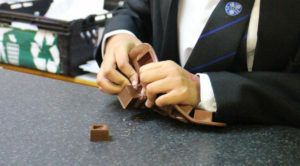 After the beans had roasted it was time for the students to crack them open and remove the ‘nibs’ from the ‘husks’. The nibs are the part of the cocoa bean that are used to make chocolate and the husks are great for mixing with soil in your garden. Next it was time to blend the nibs until they made a lovely smooth and fragrant paste. This starts to break down the fats in the cocoa, which give chocolates it’s taste and texture. Next they added in more cocoa butter. Although the cocoa beans have cocoa butter in them already, it’s not quite enough to make it the smooth and rich texture we all love so much. 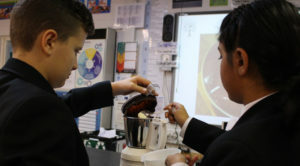 After they added the cocoa butter and blended it until smooth, they weighed out the right amount of sugar and powdered milk. Bruce explained that they use powdered milk as you don’t want to add any liquid to the chocolate otherwise it won’t set in the fridge. 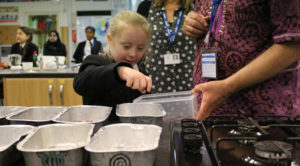 After all the ingredients had been added the students blended the mixture for a long time to make sure it was all mixed together. Bruce warned them that if they stopped the mixer too early they could risk having their chocolate turn solid. 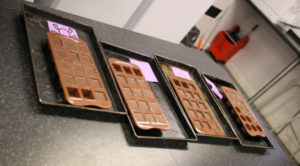 Finally it was time for them to put their cocoa mixture into the moulds. Then it was lunchtime and the students left their creations in the fridge to harden. They were all very excited to come back and see them! Then they popped them out of the moulds ready to eat right there (or take home for later). 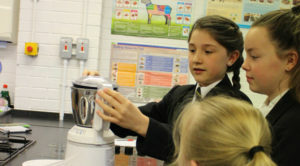 It was a really great day where the students learnt a lot about Fairtrade and chocolate! Thanks so much to The FIG Tree, Bruce and Co-op!